"The session was ultimate! 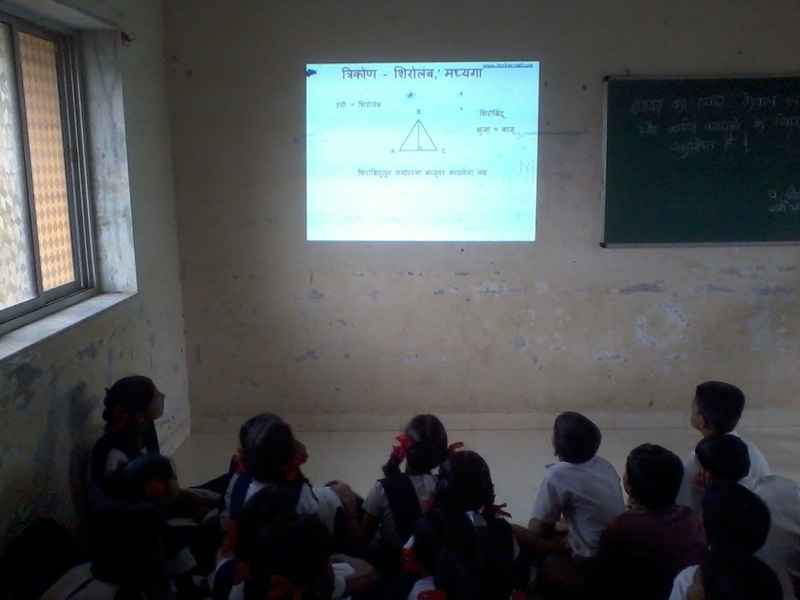 When I started your Maths CD, the students were very enthusiastic to watch the lesson. Some of them asked me to repeat the session. I played the triangle chapter 3 times and they understood very well. We are going to take these sessions every Saturday." "I looked at your Math lessons in Marathi and found them very well done. The examples are good and commentary is very clear. We work with children of construction sites and slums in Pune. We can certainly use this to aid our teaching." "Thank you for taking the time to explain these concepts in such detail. I love the process-oriented approach to understanding and solving each Math problem. This is a great resource for students, teachers and parents." "गणित हा विषय तसा अतिशय सोपा आहे, परंतु केव्हा.. ज्या वेळी गणितातील मूलभूत संकल्पना अधिक स्पष्ट होतील.. त्यासाठी ही साईट अतिशय उपयुक्त आहे व मनोरंजनात्मक आहे. सदर उपक्रमास हार्दिक शुभेच्छा!" "सर्व प्रथम आपले अभिनंदन! मी व माझ्या सारखे अनेक शिक्षक आपले आभारी आहोत. कारण, आपण तयार केलेली वेबसाईट खूप उपयुक्त असून त्याचा बराच फायदा होतो आहे." "आपली वेबसाईट पहिली आणि एका मराठी व्यक्तिने बनवलेली सुंदर साईट बघून खूप आनंद झाला .मी प्राथमिक शिक्षक आहे, ह्या साईट वर गणित हा विषय अतिशय सोप्या पद्धतीने मांडला आहे. त्याबद्दल आभार!" "Great work. Hats off to you. I was explaining to my son the division of fractions in marathi and these lessons were the immense help. Please keep this up, especially the Marathi lessons are really really required by many." "Just before his exams, my kid got lost in the HCF and LCM maze...much like Abhimanyu in the Chakravyuha. The first site that cropped to my mind was thefreemath.org ...because to know math is one thing, to simplify it to lost souls is another. I was pleased to see that the pages opened fast enough because patience is not our forte. Simple steps and different methods to reach the solution make it an easy and fun learning experience...and Axl seems to log into thefreemath.org on his own just to nail me with other methods....or tally my answer!! Prajakta - I like it that you have the Marathi option. Jai Maharashtra!" "Awesome amazing tricks! Very useful for 6th and 7th standard. Thank you." "Thanks for creating this useful website. It is helpful to all maths teachers. New creation, excellent work....... words are not enough to say. I want every teacher to use new technology in teaching and give more knowledge to students." "THANKS SO MUCH! This has helped with my homework so much! Thanks again!﻿ "
"It is very useful to village students who couldn't get proper guidance or coaching. I appreciate this website. Thanks!" "It was a good experience but you should include more videos and make worksheets a bit harder!" "This is awesome! Such tricks are critical to be proficient at Math and work with it as 'fun' and not a burden!" "I am happy to see that you have taken this initiative. Math is the only subject that needs Guru, rest all can be read and understood." "Percentages were hard for me. Your videos really helped. They are amazing! Thank you." Copyright 2012-14 thefreemath.org. All rights reserved.